March Madness is about to get a little bit bigger. The NCAA unveiled its plans for the newly expanded 68-team men's basketball tournament Monday: Beginning next March, eight teams will play early the opening week in a "First Four" round, with the winners advancing to games on Thursday or Friday. 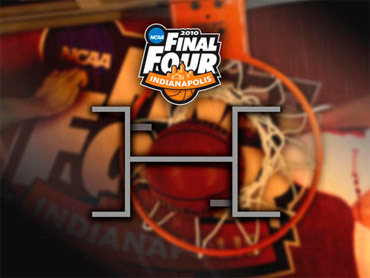 Two of the games will match the tournament's lowest seeds, Nos. 65 through 68. The other two games will include the last four at-large qualifiers. The format appears to be a compromise. Including the lowest at-large teams will probably prevent mid-majors from being over-represented in the first round, but it could also mean that two teams from bigger conferences - those generally seeded between 11th and 13th - will be out before the tournament really gets going. "You're not going to come up with the perfect model," committee chair Dan Guerrero said. "You're not going to come up with a model that is going to appease every constituency out there. But we felt that this model provided the opportunity to do something special for the tournament." There has been only one early "play in" game since 2001, when the field expanded to 65 teams in a move that essentially added a 34th at-large team. Now, there will be 31 automatic bids and 37 at-large bids. "Those teams and what would be the 34th at-large team would create better drama, if you will, for the tournament," Guerrero said. The at-large teams will be seeded where they would normally be placed in the bracket, meaning a first-round game between two No. 10 seeds would result in the winner advancing to play a No. 7 seed. Guerrero and NCAA vice president Greg Shaheen noted that three of the four at-large teams wouldn't have qualified at all under the 2010 format. Still, they said the committee was sensitive to the fact that some big-name teams could exit shortly after brackets are printed out. "We took that into consideration," Guerrero said. "That would have been the consideration if all eight at-large teams had been a part of the "First Four." The expanded tournament allowed for three new at-large teams to get into the tournament. We felt it was appropriate since we had a 68-team model, that those three teams be a part of that equation, along with the 34th at-large team." The dates and locations for the first-round games have not been determined. Dayton, Ohio, which has hosted the early game since 2001, is under consideration to host all four "First Four" games. "Dayton has been a great venue and a great site for the opening-round game, and we anticipate discussions relative to Dayton continuing in that regard," Guerrero said. "However, as the committee looks at the possibilities of the future, there could be a number of other scenarios that could come into play. We are certainly looking at Dayton as the venue for the First Four." All games will be broadcast on Turner Broadcasting's truTV. The NCAA said there could be games on both Tuesday and Wednesday. If that were the case, the Tuesday winners would play Thursday and the Wednesday winners would play Friday. The committee decided against making the lowest eight at-large teams or the lowest eight overall seeds to play their way into the final 64. "In the end, we selected a format that we felt allows us to break new ground," Guerrero said. "We are excited about the concept of the First Four, and we are really pleased with where we wound up and think that it would add value to the tournament as we move forward." Turner Broadcasting is a unit of Time Warner Inc.